PART FINDER FRIDAY – Coin batteries! « Adafruit Industries – Makers, hackers, artists, designers and engineers! PART FINDER FRIDAY – Coin batteries! For small projects (like the iCufflinks) you’ll want a small battery. When even a AAA is too big, look to lithium coin cells! These are common, often used in calculators, watches, etc. We have two favorites, the CR2032 which is 20mm in diameter and the CR1220 which is 12mm. They are very popular sizes, and have other variations that may be less common (such as CR1216 which is only 1.6mm thick). Be sure to check our coin holder section as well to find a matching holder. ALL THAT AND MORE, IN THE PART FINDER! The prices for these are all over the map. E.g. for CR2032, I’ve seen everything from $0.25 to $3.50. Digi-key is a good bet. But look out for fakes/duds. I bought a batch of CR1616s that showed 3v with a meter, but couldn’t supply any meaningful current in the application. 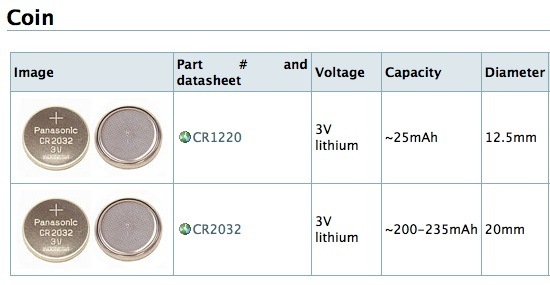 What I find funny, is how getting just 3 CR2032 cells is cheaper from Digikey than from any retail store I know of EVEN when you include an $8 shipping cost and don’t get anything else in your Digikey order. Retail stores must have quite a high profit margin on the coin cells. Note that many of these cells are not spec’ed to provide “meaningful current.” The fact that they’re heavily used to power LED keychain lights and similar is essentially abuse well beyond their original design. Also of interest may be the CR927 size, which is widely used in blinky body jewelry. Retail stores have a high margin on everything! That does not necessarily translate to profit, though. Lots of retail and online stores will sell a popular item at a loss to get you “in the door”. They know you’ll probably buy something else while there. I’m a big fan of the rechargeable CR2450. 3.7V, 110mAh. It’s big, but will run a real time clock for years! BTW – that last statement is personally untested.